Welcome to another issue of the Woods Hole Group Newsletter. The second decade of the 21st Century continues to prove an exciting time of growth and new opportunities for Woods Hole Group. In this issue of the Newsletter, we have two important announcements. The first is the opening of our office in Rio de Janiero, Brasil to support our oceanography contracts with Petrobras and partner C&C Technologies. We hope to to use this office as a means to grow our oceanography and coastal practices in the thriving Brasilian market. The operation was spearheaded by Robert Catalano and is to be managed by André Vitta and Ivan Soares. We could not be more pleased with these initial hires. You can learn more about the two of them in the body of the article. The second announcement features a strategic staff addition here in the Falmouth office. 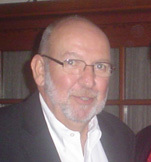 On March 26, 2011, Dr. Jerome Cura, LSP joined the Woods Hole Group as a Senior Environmental Scientist. Jerry has long been a key player in the ecological risk assessment field and greatly strengthens the Company’s environmental capabilities. We look forward to continuing the growth of our environmental practice with Jerry's leadership. On another front, we are now mid-way through our Task Order Contract with the New England District of the U.S. Army Corps of Engineers. The Company decided to use the halfway point of the program to proactively evaluate our own performance and the performance of our subcontractors. Paul Dreyer, a Senior Engineer with Woods Hole Group who was not affiliated with the contract, conducted the Mid-Program Review, which included over two dozen interviews and a survey of one-hundred and twenty project deliverables. The Company management used this review to establish the basis for improvements in our overall operations and project management. Enjoy the articles on the Brasilian operation and our new Gulf of Mexico data assessment with DeepStar. We look forward to continued achievement during the rest of 2011, which is our 25th Anniversary, and we wish you all success as well. Thank you for taking the time to read this Newsletter. Woods Hole do Brasil Ltda. All the legal documents have been filed and we are clear to conduct independent business in Brasil. 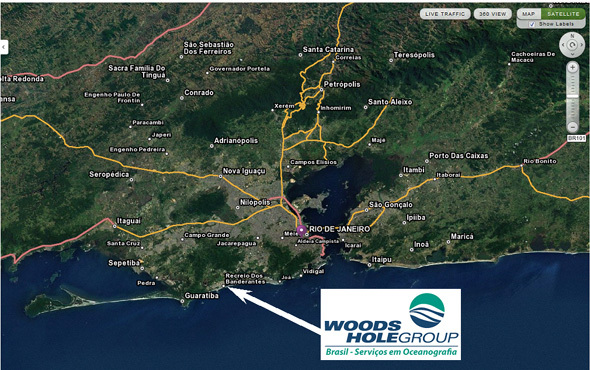 For the past three years Woods Hole Group had been working in Brasil as a subcontractor to C&C Technologies (Lafayette, LA and Brasil). Woods Hole Group is currently working jointly with C&C Technologies on two large, multi-year contracts and will continue to work on these and additional projects with C&C Technologies. These contracts have allowed Woods Hole Group to become acquainted with doing business in Brasil and to establish many contacts in the oil & gas and coastal engineering markets. The offshore oil industry has collected current profile measurements from floating production facilities (FPFs) and mobile drilling units (MODUs) in the Gulf of Mexico since 2005. This program has been conducted under mandates issued by MMS (now BOEMRE) in the form of Notices to Lessees (NTLs). Data have been collected from over 30 FPFs and more than 50 MODUs, providing roughly 200 years of current profile measurements. The data are reported in near real-time to the National Data Buoy Center (NDBC) where they receive initial quality checks and are quickly archived and made publically available through the NDBC website (see http://www.ndbc.noaa.gov/maps/ADCP_WestGulf.shtml). 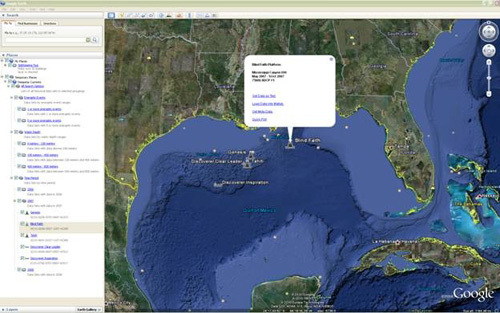 Example of Google Earth interface that will be developed by Woods Hole Group as part of the DeepStar Project. Although NDBC’s near real-time processing and quality checking of the data provides useful products to assist operations in the Gulf of Mexico, it is not intended to provide the level of quality assurance that structural engineers and oceanographers need to develop design criteria and to better understand the complicated and vigorous ocean circulation features in the Gulf of Mexico. Further, inspections of the archived data revealed that some measurements, especially near-bottom data, are absent. Some of the measurements, especially near-surface data, also contain systemic and systematic errors, such as erroneous measurement locations, instrument headings, etc., which needed to be addressed. 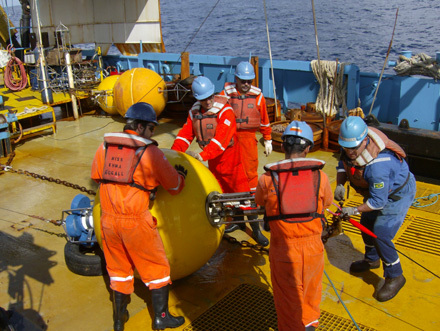 A second major and equally important set of current data in the deepwater Gulf of Mexico has been collected through series of focused deepwater current measurement programs. These programs were begun in the late 1990s and have been funded through the MMS Environmental Studies Program (now BOEMRE). The measurement programs have advanced from east to west in the northern Gulf of Mexico, and have focused on understanding important physical processes, such as the Loop Current, Loop Current Eddies, and Topographic Rossby Waves. 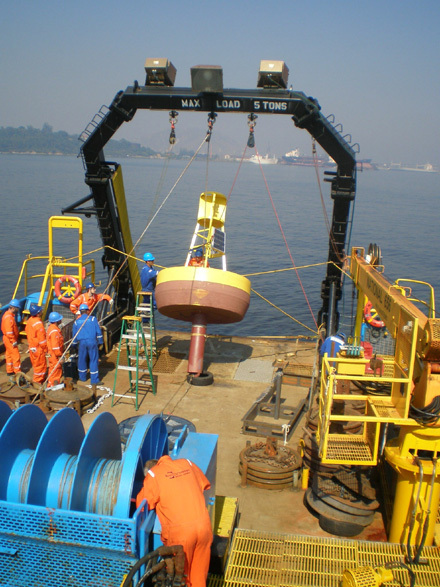 A variety of techniques have been employed, including current meter moorings, satellite data analysis, drifter studies (surface and subsurface), hydrographic sections, and geostrophic current estimates using inverted echo sounder (IES) technology. These data are thoroughly quality controlled and have been analyzed and reported in MMS Technical Reports and refereed literature. All physical oceanographic data collected in the Environmental Studies have been archived at the National Oceanographic Data Center (NODC), where they are publically accessible. As with the NTL data at NDBC, the data require supplemental processing for use by industry engineers. 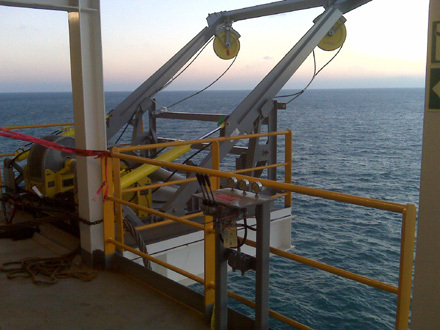 Woods Hole Group designed ADCP Launch and Recovery System. The combination of industry sponsored NTL data sets and MMS Environmental Studies data sets is perhaps the largest archive of current data in any regional ocean basin. However, due to the data being held at two different locations (NDBC and NODC), in significantly different formats, and need for supplemental data quality assurance, industry engineers find it difficult at present to take advantage of this incredible resource. The DeepStar joint industry technology development project decided to apply some of its resources to meet its members' deepwater business needs to deliver increased production and reserves. DeepStar provides a forum to execute deepwater technology development projects and leverage the financial and technical resources of the deepwater industry. Participating companies presently include: Anadarko, BP, Chevron, ConocoPhillips, Maersk Oil, Marathon, Nexen, Petrobras, Statoil and Total. See http://www.deepstar.org/ for more information. To date, available data sets have been gathered and are being prepared for quality checking. The first step is to ensure that available data are indeed in house. For the NTL data this will entail checking time lines of data downloaded from the NDBC website for each NDBC station against an independent record of the activity of mobile drilling units and floating production facilities to identify any possible gaps. Likewise, time lines of the Environmental Studies Data obtained from NODC will be compared to time lines presented in the MMS Technical Reports. A variety of quality checks will be undertaken to ensure that the resulting data archive includes only data whose accuracy can be reasonably assured. This project is scheduled to be completed by the end of this year. Woods Hole Group Continues to Grow in 2011! Jerome J. Cura, Ph.D., LSP has joined Woods Hole Group in the position of Senior Environmental Scientist. "Jerry is a great addition to the Woods Hole Group staff and significantly increases our capabilities in environmental assessment in general and ecological risk assessment in particular,” said Dennis Aubrey. "I am very pleased to be joining the Woods Hole Group Team. 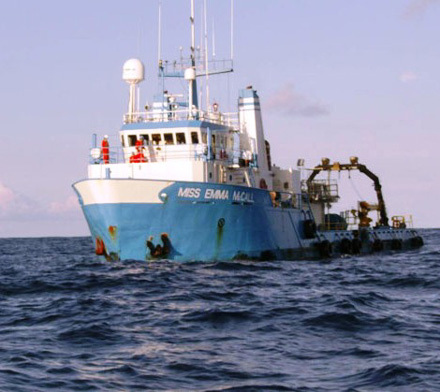 Over the years, I have participated in many successful technical projects with the Woods Hole Group oceanographers and environmental scientists as a consultant to the company,” Jerry Cura said. “Now, I look forward to a serving the best interests of Woods Hole Group clients as a senior scientist." Click here to email Jerry. His telephone extension is 282. Dan Rogers is the 2010 Woods Hole Group Employee of the Year! Dan has been with Woods Hole Group since 2006, and supports various ongoing programs with NOAA PORTS, USACE, and other clients. Dan is a licensed captain, and has extensive experience with monitoring environmental conditions for the power utility industry. 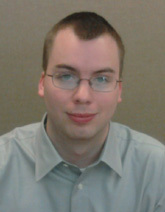 Eric Holmes started working at the Woods Hole Group Falmouth office at the beginning of 2011, in the position of Coastal Engineer and Modeler. Eric received his B.S. and M.S. in Physics from the University of Massachusetts: Dartmouth, where he worked as a research assistant modeling upper ocean physics using 3-dimensional non-hydrostatic models. 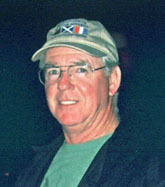 Following graduation he worked at the UMass School for Marine Science and Technology(SMAST) as a research associate, where he was involved with using FVCOM and SWAN to model coastal processes in Skagit Bay in Washington. As a graduate student he traveled to Japan and took part in a research cruise headed by the Tokyo Institute of Marine Science and Technology aboard the R/V Natsushima. 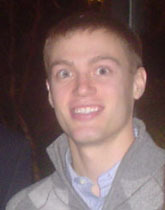 Eric currently lives in New Bedford and is engaged to be married June 30th 2012. Eric is very happy to be a member of the Woods Hole Group team. We are also pleased to announce that Brent Payne has joined Woods Hole Group, in the role of Coastal Engineer. In April, Brent and his wife, Lynn, had their first child. Jean Luke Payne is a happy and healthy baby boy. 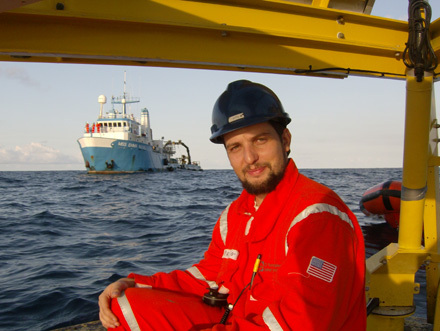 Brent specializes in coastal hydrodynamics and sediment transport. He has previous work experience in land surveying. He received his B.S. and M.S. in Civil Engineering from Old Dominion University in Norfolk, VA. His M.S. thesis was titled ‘An Analysis of FEMA Guidelines for Coastal Dunes using a Numerical Model.’ Brent is proud to be a new addition to Woods Hole Group. Dave Walsh presented "Quantifying Shoreline and Subaqueous Erosion as a Component of a Sediment Budget for the Delaware Estuary" at the Delaware Estuary Summit in Cape May, NJ on January 30 - February 2, 2011. Dr. Bruce Magnell and Dr. Todd Morrison attended the first annual Arctic Technology conference in Houston, TX on February 7-9, 2011. At the conference, Dr. Magnell presented "Waves, Ice Draft, and Floe Size Measurements in the Beaufort Sea Using Bottom-Mounted Ice, Wave, and Current Acoustic Profilers", a paper authored by Dr. Magnell and Dr. Leonid Ivanov of Woods Hole Group and Eric Siegel of Nortek USA. Dr. Lee Weishar attended the Florida Shore & Beach Preservation Association (FSBPA) Conference in Jacksonville, FL on February 9-11, 2011. Leslie Fields attended NOAA CSC CSMP Training in Charleston, SC on February 16, 2011. Dr. Lee Weishar attended the ASBPA Coastal Summit in Washington, DC on March 1-3, 2011. He is on the ASBPA Board of Directors, and used this opportunity to meet with Members of Congress as related to critical coastal infrastructure needs in the United States. Dr. Bruce Magnell and A. Todd Morrison attended the Current, Wave, and Turbulence Measurement Workshop (CWTM) in Monterey, CA on March 20-23, 2011. They organized a workshop on "Phased Array Surface Current and Wave Radar Systems". Phased array surface current and wave radar systems use electronic beam steering technology to receive radio wave backscatter from the sea surface in narrow beams. The session presented objective information on phased array surface current and wave radar systems by vendors and users. Dave Szabo attended BOEMRE Information Transfer Conference in New Orleans, LA on March 22-24, 2011. Dr. Lee Weishar will be presenting "Regional Sediment Management Combined with an Ecosystem Restoration Project in Chatham, MA: A Local Approach" at the conference. Woods Hole Group is a Gold Sponsor for the the event, which produced $56,000 in Scholarships to 15 recipients in 2010. Bruce Magnell and A. Todd Morrison will chair a panel on Tuesday, May 17th at 10:30 am on the "Expanding Role of the Environmental Measurement Systems in the Marine Marketplace". Speakers include members of government (USACE & NOAA), research (Woods Hole Oceanographic Institution), and industry (DeepWater Wind). Corporate Sponsors for Falmouth Commodores and Youth Lacrosse. Woods Hole Group will be the Corporate Sponsor for the game on Saturday, July 23rd at 5:30pm vs Brewster Whitecaps! We look forward to the upcoming season, which features some of the best college players throughout the United States. Woods Hole Group also sponsors Falmouth Youth Lacrosse. We look forward to bringing you the next issue!